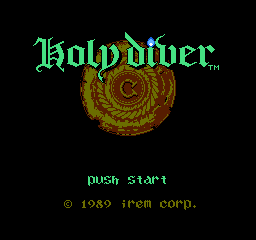 Holy Diver is a platforming action video game with some rad references to rock musicians. 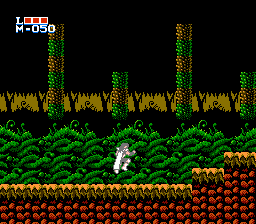 Developed by Irem in 1989, it was exclusive to the Japanese market, and never released outside of said-country. 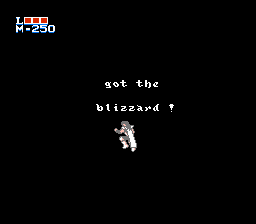 Gameplay can be described as a combination of elements from Metroid and Castlevania (not to be confused with Metroidvania) with the protagonist being able to shoot balls of energy forward or above from his hand, and collecting powerups throughout the stages and beating bosses (similar to Metroid). The overall design and artstyle of the game can be compared to Castlevania. You play as Randy, an infant son of the weakened 16th Crimson Emperor Ronnie 4th, who is on a quest to obliterate the evil Black Slayer, and restore power to the lineage of King Crimson. 100% English Translation of Holy Diver. No known issues. Monaco Hacking Also translation and editing.